Customer segmentation is a critical means of customer evaluation. It is no secret that not all customers have similar value for a business. For survival and prosperity sake businesses have to make a choice and invest money and effort into building strong relationships with those clients that will bring affluence and success to the company. However, in spite of all endeavours something may still go wrong and the most promising customers may turn into passive or even dissatisfied clients. Then it is time for your recovery policy to prove its efficiency. If your company can turn dissatisfied or passive customers into delighted and happy clients, if it can cipher out discontentment at its early stages then you can kick-start profitable relationships with your customers anew. A customer is a supreme value for any organization, thus, managing relation with customers directly influence financial performance of business. Customer satisfaction, as well as customer retention and acquisition of new customers are top KPIs in this category. It has been proved that an efficient management of customer relationships leads to a better financial performance in the long term. 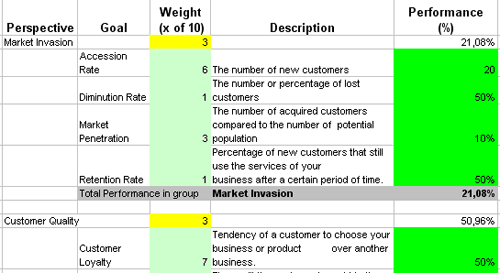 Download trial version of Customer Relationship Performance Indicators. Purchase full version of Customer Relationship Performance Indicators + bonus. Informing customers of what's going on at your place is a key to build healthy customer relationships. Managers need to assess customer relationships as it helps in creating a loyal customer base. After all, customers are the ones who provide revenues to act as the financial fuel for the company. Its all about being answerable to your customers as they shell out their hard-earned money to have your offerings. To maintain the relationships, there has to be a mechanism for tracking the movements of this direction. A scorecard is a strategy often used by organizations to gauge the progress and create a network of useful relations with their customers. The indicators are phrases to which values and numbers can be assigned for further consultations to dig the problems that come up. Also, by taking effortful steps for developing and sustaining long-lasting relationships with customers, it is possible to stand the tough 'competitive blows' that often are the reason for uprooting of even the well-established organizations. This makes a compelling enough push to send intelligent and involved organizations go for taking steps to build customer relationships. Related metrics and KPIs for: Call-Center, Help Desk, Interactive Voice Response, Customer Profitability, Customer Profiling, Customer Value, Customer Conversion, Customer Loyalty, Cell Phone, Internet Access. Customers who viewed this item also viewed: Knowledge Management Metrics Pack | Marketing Research. This is the actual scorecard with Customer Relationship Performance Indicators and performance indicators. The performance indicators include: customer relationship scorecard, customer quality, customer long-term value, customer life span, customer segmentation, satisfied customers, dissatisfied customers, customer potential, damage and recovery manager, dissatisfaction management. Download a trial version of Customer Relationship Evaluation Balanced Scorecard or purchase a full version online. All articles about measuring performance in CRM.